Asbestos continues to be a concern in modern construction – it’s not an issue only in older buildings, as many people believe. A brand new children’s hospital in Australia has found Chrysotile asbestos in roof panels that were imported from China. 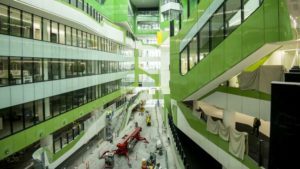 ASBESTOS has been found in a roof panel at Perth’s new $1.2 billion children’s hospital, which will force the replacement of the entire eighth floor atrium roof and require workers to undergo testing for exposure.